I have been meaning to make bread with Carla for a long time. Why haven’t I? Well, my biggest constraint with Carla, as you know, is time. How can I possibly make bread in an hour? Aside from the whole kneading process, which is too hard and time consuming for a six-year old, bread takes time because of the rise. However, I was still not ready to give up the idea of making some sort of bread. Then looking at my wish-to-bake-soon list I realized that high on top of it I had written Irish soda bread. I also had a link to a post written some time ago by Trish at Dish by Trish, who made these adorable mini Irish soda breads. Genial! Making small breads instead of a single loaf definitely cuts the baking time, hence making the recipe doable with Carla. Thanks Trish! I did not have a recipe that was for sure traditional so I did some research on the web. Before leaving you with the recipe, I would like to suggest you check out this link if you will ever decide to make Irish soda bread yourself. There are many recipes around, each a little bit different, but this site really clarifies all the basics you need to know about the traditional Irish soda bread. It really is an easy recipe and the traditional one has 4 ingredients! Yes, you can maybe add raisins or other fun stuff but I followed the website suggestion of first mastering the basic recipe before experimenting with it. 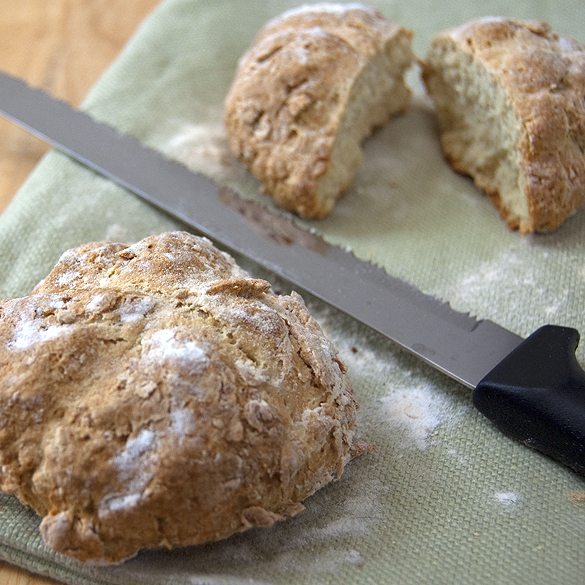 If anybody (Irish or not) has a family recipe for Irish soda bread, I would love to hear from you! I’m looking forward to make this bread again and to try different versions of the recipe. For the moment, I trusted this one. We loved this bread. It was really easy to make for Carla. No kneading, no waiting time, no hard dough to shape. And perfect for tonight dinner. Preheat the oven to 450F degrees and prepare a baking sheet by dusting it lightly with some flour. Sift the dry ingredients together at least once or twice to make sure the baking soda is evenly distributed. Put the sifted dry ingredients in a big bowl and make a well in the center. Pour about three-quarters of the buttermilk and start stirring. The dough will be soft but lumpy. Add more liquid if needed. Blend quickly being careful not to mix too energetically or the breads will result too hard. Turn the dough onto a floured surface and knead very very briefly (the website suggests about half minute and adds that even 15 seconds could be sufficient. Also, we actually just kneaded the dough in the bowl…less messy with a kid). Divide the dough into 5-6 balls and place them on the prepared baking sheet, flattening the tops. With a sharp knife, cut a cross across the top of each circle of dough. The cut should go halfway down through the sides of the circles. Bake at 450F degrees for the first 10 minutes. Afterwards, lower the oven temperature to 400F degrees and bake for another 10-15 minutes. Let the breads cool on a cooling rack before serving them. These breads are gorgeous! I wish Sophie lived close by you she could go over and bake with you as well (especially since her Mommy doesn't bake much). I love soda breads!! And yours look so cute and flaky. That is a great link. Thanks for the information. CHeers. What a wonderful idea! I've never actually had a soda bread, but this is one Liv could do herself. She's finding her hands in the kitchen lately (made crepes all by herself yesterday!!). I'll bet Carla really looks forward to that hour with her, and her parents to the leftovers! wow! they look gorgeous! i so craving for some right now. thanks for sharing this. I will be back for this recipe when we get closer to St. Patrick's Day. So perfect with Irish stew. Adorable. I haven't made Irish Soda Bread for a long time - will definitely consider making minis next time, though. They're so cute. Love that I don't need yeast! And how cute are the minis!! I love it...something I might succeed at making! Love soda bread. Actually just baked something pretty similar this morning. Yours look wonderful. I always make soda bread every year, but have not made the mini size. The minis are so cute, and they do freeze well. What beautiful little breads - love that you did them tiny. I bet they tasted amazing!! I love soda bread and have not had any since living in Spain. I'll be trying out your recipe very soon, thanks. I love soda bread! I was thinking of doing something of this sort for St. Patty's day and after seeing this, I really want to give it a go! I love Irish Soda Bread but have never made my own. I'm definitely going to try out your recipe. Your soda bread looks gorgeous. :) What a fun baking project with Carla! I do love irish soda bread and the mini-loaves are adorable. Thanks for doing all the research to find the most authentic recipe! 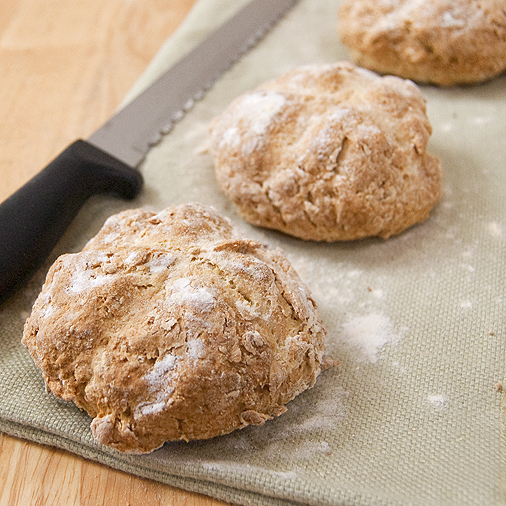 Irish soda bread is hands-down one of my favorite things to make and eat -- any time of the year. I've always made a large circular loaf, but almost always have the problem of undercooking the center. Not sure what my issue is (thoughts?). I'm very excited to try several smaller loaves, in hopes of better success! What a great idea! They look so delicious. I love the size of them. Beautiful bread! I love that you posted this recipe in time for St. Patty's day! Great side to your typical dishes like Colcannon or Corned Beef and Cabbage! I've never had Irish Soda bread. It looks really good! I adore soda bread. What a great concept to make little baby loaves! That recipe is on my list too! My list is so long, I figure I should be making it in about 3 years! lol Hoping you are feeling better, I know all those little germ carriers have been keeping you sick. Thanks for the link, I like to read stuff like that. @squirrelbread: if you make a single loaf and it doesn't cook well inside you might want to lower the oven temperature a bit a leave it in a bit longer. Sometimes it just depends on the oven ventilation system. Making smaller breads for sure solved that issue! those little soda breads are beautiful...the color and texture make them so appealing..I hope Carla had fun making these little breads with you! I have never made Irish soda bread but do enjoy it, thanks for giving the inspiration to make it. Gorgeous bread! I bet Carla loved making the mini loaves. I can imagine it warm soon after it came out of the oven, Delicious and such pretty photos,:) Buon Weekend Sara! soda bread seemed to be the trend of the week. love the mini loaves. so pretty. I have the feeling Carla had a wonderful time making them. amazing! I made these yesterday for dinner and my boyfriend loved them so much that I made them again today for breakfast! I will definitely be making these again. thank you thank you thank you from germany! @Paula: I'm glad you liked them. Honestly, we liked them so much that I'm making them pretty often now, when I don't have time to bake with yeast. Love this so much! Amazing! I plan to make these tomorrow!